H&M’s 2013 -2014 Fall and Winter Home collection is just as vast as that of other retail brands like Zara or Marks and Spencer, and their take for the Christmas season offers some interesting and different ideas to help cheer up your rooms during the holidays. 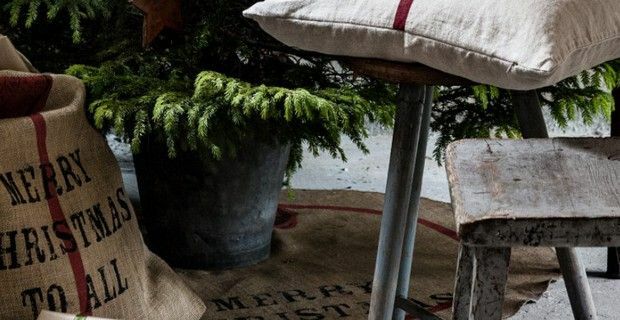 Beside their Basic Collection that contains items that range from bedspreads to duvet sets, from curtains to cushions, from bath towels to table line, placing a certain importance on the textiles they use, that go from cotton, velvet, linen, shine (polyester) and cotton terry cloth, they also feature four special home décor lines for this 2013 Christmas. The first is Modern Tradition which is based on a red and neutral color palette and that gives off a certain warm and rustic tone. This line contains a tablecloth in organic cotton, a table runner, a jute Christmas sack, a Christmas tree mat, a ceramic mug and rectangular plate with a Happy Holidays motif. Winter White is more of a living room décor with cushion covers that range from faux fur to sequins or have sparkly star gem appliqués or simply a text print in a mix of silver grey and white shades, and this line also has a faux fur blanket, while Sparkling Hobo is dedicated to the bedroom and guest bathroom. Here you’ll find a single duvet cover in fine-threaded cotton with a bird print with separate pillowcases, a bedspread with quilt stitching in a with glossy viscose velvet on the front and cotton in a contrasting colour on the back that is available in either dark gray or dark purple and there are guest towels in velour with the same bird print motif as the duvet as on the bathmat. Flirty Holiday returns to the kitchen with a tablecloth and apron in woven organic cotton fabric, but also a napkin holder, lacquered metal biscuit cutters in different shapes and a two-tier metal tin with a lid. You can find these four Christmas collections available on H&M’s website along with numerous other items.